The Orchestra of the Hawaiian Islands presents the Sakura Ensemble at 6 p.m. Wednesday, April 28 in Thelma Parker Memorial Public and School Library, Waimea. Admission is free. Sakura Ensemble members Jean Pierre Thoma, flute and Annu Shoko Shionoya, piano, will be joined by Philip Simmons on guitar. Together they will perform a program of Hawaiian, European, and Japanese music. American born and world traveled, Jean Pierre Thoma has performed on flute and saxophone, and toured more than 21 countries in his long musical career. Holding two Master’s degrees in music, he has taught in settings from Hawaii to France. Some of his performance highlights have been: International touring with Russian folk ensemble; Japanese Noh drama performances; soloist with the Maui and Marin County Symphonies, featured performer in the Panzano Italy Jazz Festival; and classical, jazz, and ethnic setting with numerous well known musicians. His recent CD – “Spruce and Gold” features classical arrangements for flute and cello, and the current Sakura Ensemble will soon be going into the studio to record their creative versions of classical European and Japanese favorites, after which a world tour is planned. Annu Shoko Shionoya is originally from Osaka, Japan. She studied and graduated from the Osaka College of Music. Then she moved to Boston and graduated from the Berklee College of Music and continued to study piano with Dr. Jam Kin, Dean of Boston Conservatory. She has performed as accompanist of violinist Isidor Ostorobsky, vocalist Asako Ebinghaus and other musicians and played in concerts in the Boston area, Hawaii and Japan. Currently Shionoya functions as “Minister of Music” at Hoolokahi Congregational Church in Kona. Shionoya also plays as a pianist/accompanist of the Kona Music Society and as a member of the Sakura Ensemble. 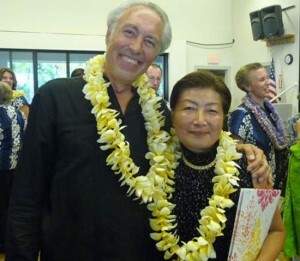 Philip Simmons is Artistic Director of American Music Festivals, and conductor of the Orchestra of the Hawaiian Islands. He is originally from Chicago, where he is Music Director of the Lincolnwood Chamber Orchestra. Simmons was Orchestra Director at Northeastern Illinois University, Lake Forest Academy, and has extensive experience as an international guest conductor. As a guitarist he has been soloist with a number of orchestras under his direction, as well as with the Civic Orchestra of Chicago and De Paul University Wind Ensemble, where he studied guitar and composition. He has performed under the batons of Maestros Lukas Foss, Michael Morgan, and Ruben Gonzalez. This evening marks his first public guitar performance in Hawaii. Philip lives on the Big Island with his wife Jennifer Schack, advancement director at Parker School. For further information, call 315-0885.